With The Rise Of Legal Weed, Drug Education Moves From 'Don't' to 'Delay' : Shots - Health News Today's drug prevention messaging is a far cry from the "Just Say No" days. Schools want to give kids the facts to make informed decisions about whether and when to try drugs or alcohol. 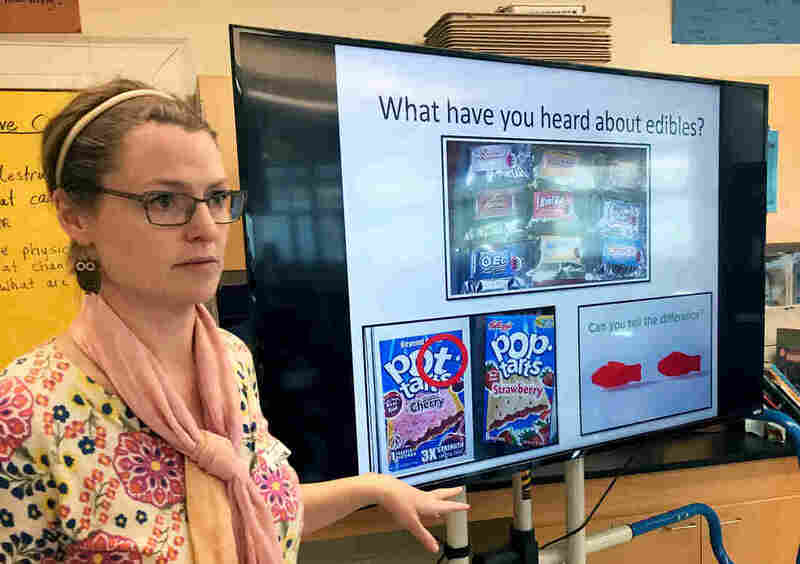 Dawn Charlton, an instructor with Being Adept, leads a discussion on marijuana for sixth-graders at Del Mar Middle School in Tiburon, California. "Coming out of SFO airport, there are billboards for Eaze [a weed delivery service] that say 'Marijuana is here,' " says Danielle Ramo, a psychologist who conducts research at UCSF on adolescent drug use. "I'm not sure parents were expecting to see so many images of cannabis all over." The rollout of legal recreational marijuana in California and other states doesn't appear to have led to any big changes in substance abuse prevention yet. But drug prevention education in schools has evolved significantly since the "Just Say No" days of the '80s — and now typically takes an approach that's more appropriate for the era of ubiquitous weed access. It's one that emphasizes decision-making and critical thinking skills instead of abstinence. To see it in action, I visited a school using the Being Adept curriculum — it's an evidence-based curriculum that has been used in about 20 schools in the San Francisco Bay Area. What I found was that drug abuse education today draws on decades of rigorous effectiveness research and the newest teaching techniques. The PSAs that Gen-Xers may remember — the egg in a frying pan ("this is your brain on drugs"), or the boy calling out his dad's drug use ("I learned it by watching you!") — live on as memes, but they're no longer used as messages. "Those scare-tactic-based programs have tended to quite clearly not work, based on most of the research that evaluated its effectiveness," Ramo says. "Today there is an entirely different mindset about school-based prevention." In a nutshell, the focus now is on facts, not fear. Also conspicuously absent are simplistic dictates like, "Just say no." Instead, teachers spur students to examine data, speculate on motives, discuss risks, and deliberate on their own goals and values. 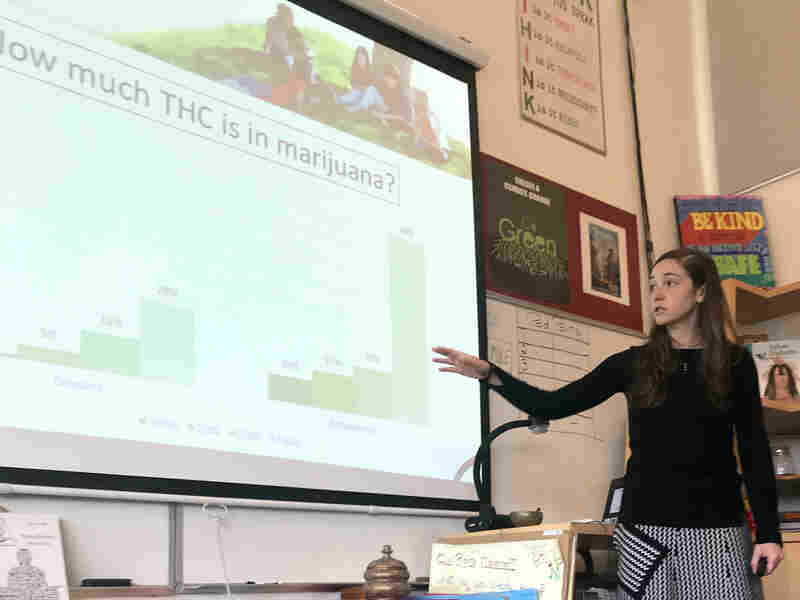 Ashley Brady explains the increase over time in marijuana potency to a class of eighth-graders at Marin Primary and Secondary School in Larkspur, California. Ashley Brady, a Being Adept instructor, was completely open about her method when she stood in front of the eighth-graders at Marin Primary and Middle School, a private school in Larkspur. "I'm not here to tell you what to do today. Not at all," she begins. "I'm here to give you the most up-to-date information possible so that you can make your own healthy, informed decisions." Brady then jump-starts a fast-paced, fact-filled discussion on brain chemistry and physiology. She shows an animated video about how marijuana affects dopamine pathways in the brain. Then she leads a discussion about marijuana "edibles" and how the liver metabolizes them. "It can take up to 30 minutes to maybe even an hour or two before it really hits you," she says. "When somebody eats an edible and they don't really feel the effects, what do you think happens?" "They eat more!" a student called out. "They eat more," Brady nods. "Yeah, an hour, an hour and a half later? Boom! Like a freight train, they've been hit, and, you know, can barely move or can barely talk, that kind of thing. So they may have to go to the hospital." True, that sounds a little scary, but it's presented neutrally, as a consequence at the end of a sequence of decisions. Where the legalization of the marijuana industry has affected the content of these lessons is on the subject of potency. Brady tells the students that legalization has spurred competition and innovation among suppliers, to the point where they're now churning out extremely potent and precisely calibrated forms of pot called "concentrates," which comes in various forms. Brady runs through their names: oil, bubble, shatter, wax and dabs. "They call it a 'dab' because one tiny little nail head [of it] — I mean I'm talking like the end of my pinky — one tiny, little nail head is the same as three joints hitting the system all at once. So it's a lot stronger than it used to be." Tests of THC levels in marijuana samples over the years back this up. Whereas a typical joint in the '70s probably had a THC level of 4 to 5 percent, at best, growers are now breeding strains of cannabis that produce buds with THC levels as high as 20-30 percent. The concentrates are in another category altogether. Processed concentrates sold at dispensaries now regularly test at 80, even 90 percent. "It's not the same drug," Brady tells them. People sometimes vomit from concentrates. Some people hallucinate and have even become psychotic. And yes, she adds, it can be addictive. Not just psychologically, but physically. People do go into THC withdrawal and do go to rehab for pot addiction. Still, as she describes the transformation of marijuana from a relatively mild intoxicant to a potentially debilitating one, Brady never once says "that's why you shouldn't" or even "so please be careful." Afterward, the students applauded this approach. "It made you feel more mature, and that you're in control," says Devon Soofer, 13. "This [class] was actually telling you the long-term effects and what it can actually do to you. So it actually made you feel like 'Wow, this is actually really bad,' and not just being forced not to do it." Later units in the Being Adept curriculum give students concrete tools: They rehearse what to do or say at parties, and talk about better ways to cope than using cannabis — or any substance. Ramo, who serves as a scientific advisor to Being Adept, decries "the overwhelming stress, anxiety, depression, suicidality that is so pervasive among teens in the United States today, especially in high-intensity educational areas, like a lot of schools in the Bay Area are." "Addressing that problem is key," she added, as is "having teens come up with solutions to manage their stress, that they actually would use." So if drug educators aren't telling students "Don't!" anymore, what exactly are they telling them to do? As I observed, they're not overtly telling them to do anything, because teens are naturally resistant to the authoritarian approach — and some of them may resist to the point of doing the opposite. Jennifer Grellman, a psychotherapist in Kentfield, Calif., and the founder of Being Adept, sums up the strategy in three words, just like the "Just Say No" campaign: "Delay, delay, delay." "The way to handle that with your kids is to say: 'You know, you don't have to use this now. Maybe you want to use it someday, but not today, not now. It will always be there.' Just tell them to wait." Grellman says that advice may be more palatable for some teens, and therefore easier for parents to deliver. They're not forbidding something (and possibly making it more enticing). They're not saying "never." The instructors put a special emphasis on a less visible risk: the potential damage to their brains. "More research is coming out looking at the ways in which all different kinds of substances can hijack normal brain functioning, and particularly so in adolescence," Danielle Ramo explains. "In heavily cannabis-using teens, there are some particularly important implications of using cannabis on the frontal lobe, and that interrupts a type of thinking called 'executive functioning.' "
Also worrisome is a substantial body of research showing that using any potentially addictive substance while the brain is still developing — whether alcohol, marijuana, nicotine, or other drug — triggers neurological changes that can lead to addiction. "The earlier teens start using, the more heavily they use in adolescence, the more likely it is that they'll go on to have problems throughout their adulthood," says Ramo. Being Adept instructors don't say it outright, but the message is clear: If you're not going to abstain, just push it off for a while. Your brain is too vulnerable right now. Grellman says parents should talk about drugs and alcohol with their kids often — as early as fourth grade. For California parents, she suggests using the new billboards or marijuana ads as an excuse to bring up the topic. Broach the subject obliquely: What do people at your school think about those ads? Do any of your friends know what a dab actually is? Did you see this article on the seventh-grader getting expelled for pot in his locker? What do you think about that? She says to listen to what they say and discuss it — try not to lecture, but be clear about your expectations, and your values around drugs and alcohol. At every school where Being Adept is taught, Grellman offers a "Parents Night" where parents can learn how to navigate those conversations. It's not just what parents say, she says, it's what they do. Children are always watching how their parents use substances. "Don't glamorize it," she advises. "It doesn't mean you have to become a monk and never have a drop of alcohol, but please drink responsibly." And, she says, don't use it for stress control. "This idea of coming home from the office and saying 'I've got to have my glass of wine' — if you want to have your glass of wine, have your glass of wine, but don't announce it! That you're just at wit's end, and you have to have this drink." Grellman says the modeling part becomes tricky when kids ask parents about their past: Did you party? What drugs did you use? When she led the Parents Night in March at Marin Primary and Secondary, she advised parents to get ready for that moment, and have answers prepared. If you did party in high school, don't lie, she told them. If a kid senses dishonesty or hypocrisy, they'll shut down. The most important thing is to keep the conversations going. If your child knows they can talk to you, no matter what, they will create a "safety plan" with you. They will reach out to you when trouble comes. "You don't have to tell the full story," Grellman said. "You could say: 'You know, I did smoke and I did drink when I was 13.' And if you loved it, I don't know if I would advertise that. "You could say, 'I did smoke, or I did drink, when I was 13. And you know, frankly? It was too early for me, man. I made some stupid decisions and I got in trouble.' You can give them the consequences of it." After the evening, parents said they felt relieved to have concrete suggestions about how to talk with their kids, and how much was OK to bring up. "It's much more prevalent than it was when I was growing up in the '80s," said Joseph Sullivan, a physician from Larkspur. "This is a different time, and so it's nice to hear that we're almost given permission to be talking about these different aspects of drug experimentation at different ages," he added. His wife, Dr. Sara Sullivan, said she's glad that the "Just Say No" paradigm is dead. "Just to give the kids more information, I think, is such a different way to approach it and I really appreciate that. And we've kind of started to have conversations in our family because of that," she explained. "To really kind of take that approach and not be like 'You're kind of out there on your own.' "
This story is part of a reporting partnership with NPR, KQED and Kaiser Health News.